Washing Machine Wizard aims to be THE place on the huge web, for the person looking for a washer or dryer. We want to make your buying decision easier. For any suggestions and improvements please contact us - we would love to hear from you. Please enjoy our site! Find out what the consumers favourite laundry detergents are and which one will get your clothes in tip top condition. Looking at how we can be prudent in using energy in our wash. Eco friendly washers and energy saving advice. Buying a new washer or dryer is a long term decision. We will help you find the best one for your needs. We provide the information. All you have to do is compare and discover. Find a new one today. With hundreds of reviews of washing machines by the people which matter the most - the customer. Find the real consumers opinions. 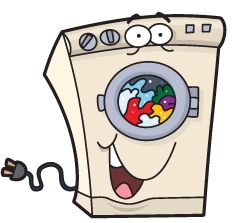 Our guides will help you find the best washing machine to get your clothes in tip top shape, giving you a heads up of which one will suit you the best. The top brands are listed to the navigation bar to the right. Please browse through our reviews and we hope you find the one which gives your clothes that extra sparkle. Don't know where to start looking? Jump start your search with a brand synopsis and let us help you narrow your picks :) The prices are in the products MRSP, they'll give you a rough guide to what the price range for the series is. The live price is found on each separate product page. Buying Help: The standard lacks certain features such as "Fan Fresh" (which circulates air allowing you to leave the laundry upto ten hours before drying), it really is the bare bones of whirlpool washers. The standard duet is a worthwhile $50 upgrade, adding features such as fan fresh, quicker spins, double the number of cycles and a basket which is 0.4 cu ft bigger. To add steam option to the duet costs at least another $250 dollars, and upto $850 dollars for the top of the range duet. Buying Help: The diverse price range of the cabrio models accomodates a wide budget range. Only the WTW800 ($1,100 +) , and above models have the allergen cycle and only the expensive Vantage has an allergen removal. All cabrio's come with precision despense, quiet spin technology, and care control temperatures. The cheapest model do not have the Eco cycle and eco monitor. Most cabio's come with the option of see through glass lid. Reviews of Sears Kenmore Washing Machines so you know which one is the best for you. Hundreds of washer reviews consumer reports. Buying Help: The smallest compact model is 3.0 cu ft but if you don't need a versatile installation you could go for the cheapest model in the performance series range (which is 3.1 cu ft) and you'll save money. The more expensive performance series are between 3.6 - 4.2 cu ft and all over $1000. If you want the steam cycle on the performance line then look at the MHWE950 and above. The Maximas are over 4.3 cu ft and all come with steam sanitization and only the Maximas have the allergen removal cycle. Buying Help: The size ranges from 3.6 cu. ft. - 4.2 cu. ft. No model comes with steam sanitization, and if you need that feature with maytag you'll have to look to the Maxima front loaders. The cheapest maytag is the more basic Centennial model. Buying Help: For steam option you'll have to pay over 1k and it comes in the Profile series or higher end traditional series. The profile is GE's most expensive front loaders, as well as the bigger basket (which is interestingly shaped), they come with a few more feature such as the overnight ready feature (put clothes in the washer and eight hours later they are ready to wear). GE offer some feature rich small washers for around $1000 which are worth considering (2.2 cu ft). Buying Help: The Harmony takes the profile model and adds many trimmings. It's bigger, faster, with a neat see thru lid and more features (such as the tidal wave wash system, tidal wave wash system, flow thru dispensing system releasing the detergent at an optimum rate throughout the wash). Buying Help: Ranging between 3.3 cu ft - 3.6 cu ft, these are the cheapest washers GE offers. Buying Advice There is two in the selection to choose from. The 4842 is a slight upgrade over the 4802. For $200 more you get 12 spin cycles instead of 10, a twenty four hour delay start and a useful digital display which makes life more easy when selecting wash options. Buying Advice There are three in the series to choose from, and the W3000 are more expensive than the larger W400 series. The reason is the W3000 comes packed with more features including, digital displays as standard, very stable Hydraulic suspension for very safe spinning, and along with a premium build quality. The W 3039 comes in a whole different design than the other two in this line. We do however prefer the W4000 series because we consider them better value for money. Buying Advice Only the 800 and some of the 500 series comes with Aqua Stop, which is a leak protection system. The 300 series are also lacking the stain removal option. However EcoAction (energy reduction feature) and XxtraSanitary (water heating upto 170 degrees F) is standard on all series. Buying Advice The Axxis is Bosch’s compact washer (1.9 cu ft). It does adorn much of features of the 500 and 800 series but comes in much smaller weighing 146 lbs compared to the 227 lbs weight of the larger series. It does lack the premium features of EcoAction and XxtraSanitary. The Axxis is the premium compact washer, it may be small but it has an engine of a Ferrari. The cheapest Axxis has no LED display. Owners which have brought LG washing machines recommend them to others. In fact Statistics show over 75 percent of owners recommend their machine.